Hours: Monday - Saturday 10:00 a.m. - 6:00 p.m.
Sunday 12:00 - 4:00 p.m.
b. ellen is an adorable shop in Cypress with endless possibilities for great looks everyday, plus GREAT VALENTINE'S DAY gifts. Recently b.ellen boutique became one of thirty-two Fossil Shop in Shops in the United States! Needless to say, b.ellen has an incredible selection of Fossil products. On top of having a huge selection of Fossil goodies, b.ellen has a ton of great lines to Ooooooohhhhhhh and Aaaaaaaaaaaaaaaaaaahhhhh over. Virgin, Saints & Angels (VSA) is another of the great lines b.ellens carries. I love it, and there selection is unbelievable. VSA makes a statement of confidence, inspired by fashion, art, beauty and symbolism. b.ellen also carries Waxing Poetic ( MY FAVORITE), Chamila, Toywatch USA, and many, many, many other jewelry lines that any woman would LOVE to receive on Valentine's Day. I am a sucker for a product or brand that is not only stylish but supports a great cause. Who doesn't love that, it's a winning situation all around, you look great and help someone at the same time. These bracelets are made from recycled rubber (by women in Djenne, Mali) and roll right on your wrist, but even better is they help children. When your purchase a bundle of bracelets (like the above picture) the purchase enables a child to have care for a day at the "Empire des Enfants" a center for homeless children in Dakar Senegal. This t-shirt is by ATX and PERFECT for Valentine's Day, what more can I say: LOVE makes my world go around. b.ellen has an amazing selection of jeans and you don't have to take my word for it because in 2010 KPRC voted and b.ellen was HOUSTON'S BEST BOUTIQUE. They also received Best Boutique in Houston in 2007, 2008, and 2009. In 2009 b.ellen was voted best JEAN store in Houston. With brands like Miss Me, Rock Revival, and more they will have a fabulous jean to fit you. Once you find that perfect pair of jeans, don't leave without a great pair of shoes. A few of the shoe brands b.ellen's carries: Sperry Top-siders, UGGS, Sbicca, Old Gringo and I hear they may have a big announcement on shoes soon. You have your jeans picked out, a great new pair of shoes, why stop there. The clothing selection at b.ellens is always super stylish. JWLA, Double D Ranchwear, Michael Star, Free People, Three Sisters, Charlotte Tarantola to name a FEW of the brands you'll find a b.ellen's. I am a blanket "lovie" freak. I adore a pretty blanket. This one from Karma Living is turquoise, pink and soft, OHHHHHHHHHH how I want this blanket. b.ellen not only offers fabulous fashions but a wonderful selection of gifts. Consuela is a super HOT line of handbags, totes, makeup bags, pillows, and bedding, frames, boxes and the most stylish magnets I have ever seen. If you remember my closet post I have Consuela magnets on my mirror in my closet. The flower magnets vary in size, color and are made of metal. Consuela also makes a big butterfly magnet and birds, they are inexpensive and addictive. You can not just have one Consuela magnet on our mirror, just like it's hard to have only one Consuela tote. Now the Karma Living Blanket and Consuela products are only the beginning, at b.ellen you will find Jan Barboglio, candles, cosmetics and fragrances. If you can't afford a Chanel bag ( I can't), then this is an adorable sassy way to show your style. Thursday Friday totes took iconic handbags and put similar images on canvas totes (several different sizes available, as well as colors and images). I have one of these totes, mine has the iconic Berkin image on it in orange, I had never seen these in Houston or a surrounding town, untill b.ellen. Brandy is on top what's hot! I had to highlight this Fossil bag, I keep seeing it on Pinterest. Again b.ellen is a Fossil Shop in Shops one of only 32 in the United States. These GoodWorks wrap bracelets are another one of those products that I love because they give back. They actually give back 25% of there net profit to good causes. This year GoodWorks is supporting charities that provide shelter for families and children affected by domestic violence. You can look stylish and be helping a good cause all at the same time. This is my FIRST ever GIVE AWAY! 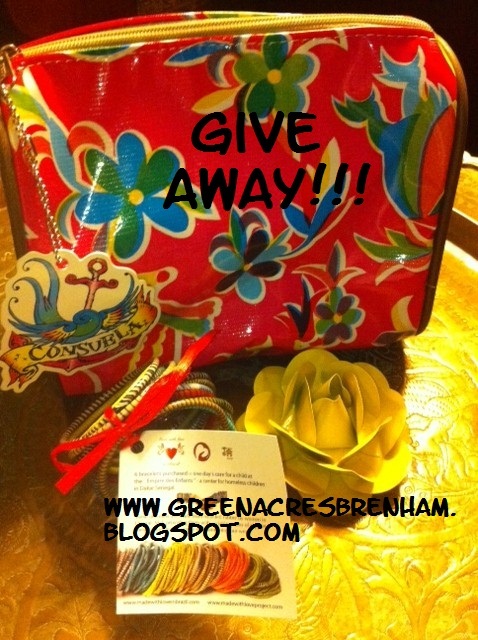 Brandy at b.ellen is so super sweet, she has provided these GREAT items for a my first give away. To win the Consuela cosmetic bag (pink floral with leopard print on sides), Consuela yellow metal magnet and 18 MWL Bracelets (a $90+ dollar value), go to Facebook and "like" B.Ellen Boutique, leave a comment on B.Ellen Boutique's Facebook page that mentions reading about the boutique on Green Acres Brenham Blog, then come back and leave a comment (with your name included) here at Green Acres Brenham. I'll put all the names in a drawing and Valentine's Day we will draw a winner. email me tikaa@sbcglobal.net and I'll mail your Fantastic Prize from B.Ellen to you. Just left a message on B.Ellen's FB page. So excited for the giveaway! I didn't realize how many different brands she offers. Visited B.Ellens Facebook and commented! Super cute shop with lots of neat stuff! Thanks for blogging bout it. Left a message on B.Ellen's fb page. So excited! Hope I win!!!! I left a message and shared your blog link! What a super cute store! I can't wait to go! Went by here today! SUPER CUTE!Great info on your blog! Thanks Tikaa for another great post..
Omgosh, I simply love your blog and of course, B.Ellen. I use to live in Cypress and now have moved to Montgomery where I live on Lake Conroe. Beautiful place to live, but not so much without Brandy and her awesome store. I make a point of driving 1 hour and 20 minutes to get to her store. I need my B.Ellen fix about every 10 days. I am dreaming of how to make my closet look as good as yours. Would love to see it in person. Keep it coming, Green Acres Brenham. This looks like such a great boutique. I don't get out that direction very often unless I am on the way to visit my daughter at Baylor. Will definitely plan to stop by on my next trip and check it out. Thanks for writing about it. Left a comment on b. Ellens page!! Hope I win!! I liked and left a message on the B.Ellen page! Cute stuff! OMGoshness I am so excited :) what better wayt to wake up in the morning ;) yay me!